Stephanie Merritt at the guardian.com offers a review of Books to Die For. One of the questions writers are asked most frequently in interviews is which writers they admire and who has influenced their work. 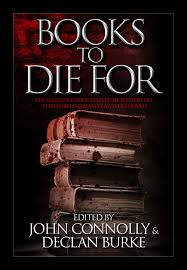 For any aficionado of crime and mystery stories, Books to Die For is a treasure trove of answers from many of the most eminent names in the genre. Editors John Connolly and Declan Burke have collected these mini-essays into a chronological if, by definition, subjective history of crime writing, from Edgar Allan Poe through to the likes of Harlan Coben and Ian Rankin. These are not intended to be academic studies; the editors’ main criterion, as they explain in their introduction, was “passionate advocacy”. The result is not a definitive canon of crime writing, but a fascinating glimpse of the way styles and influences can echo through generations and across cultures, begetting seemingly endless variations on what is, at heart, a simple formula. Some contributions are highly personal, detailing not only the author’s love for the book in question, but often including anecdotes about an encounter with the author. Ian Rankin recalls meeting the British noir writer Derek Raymond in a bookshop; Joseph Wambaugh says little about his chosen book, In Cold Blood, but tells an entertaining story of a visit to Truman Capote’s home, and of how Capote encouraged him to write his own true crime study.